Heather McKay, Moorestown Friends School Class of 2000, was honored with the MFS Young Alumni Award on Friday, May 1 at the school’s annual Dinner Among Friends. The MFS Young Alumni Award is given to graduates who, on or before their 15th high school reunion, have distinguished themselves through meritorious achievement in the early years of their careers. Recipients of this award demonstrate commitment to the values and spirit of MFS after graduation by pursuing challenges and upholding the Quaker values of simplicity, peace, integrity, community, equality and stewardship. McKay is at the forefront of research and scholarly work in the areas of work-readiness initiatives and access to education, particularly for those who are economically and educationally disadvantaged. The award was presented to McKay by her former history teacher, Judy van Tijn. McKay is the founding Director of the Education and Employment Research Center (EERC) at Rutgers University. EERC conducts research and evaluations on education and work-readiness programs and policies. Areas of expertise for the EERC include state and federal workforce development systems, online learning, community colleges and college completion, workplace literacy and more. In her remarks at the Dinner Among Friends on Alumni Weekend, McKay referenced her month-long senior project, working in Senator Diane Allen’s office, as a seminal career experience. She was able to speak to many of Senator Allen’s constituents. She went on to earn a B.A. with a double major in political science and history at Bryn Mawr College and two master’s degrees from Rutgers in global affairs and history. 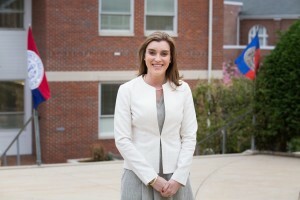 She is currently pursuing her Ph.D. in global affairs at Rutgers. Her desire to make an impact on people’s lives originated at MFS. During her four years at MFS, McKay was a member of the Agenda Committee for Upper School Meeting for Business and served as the Student Leadership Chair for the Middle States Accreditation Committee. She was a member of the varsity girls’ soccer and girls’ lacrosse teams and competed nationally in sailing. “Moorestown Friends and my teachers, coaches and friends played a really important role in the work I chose to do and the way that I chose to do it,” McKay said.